and wild to hold, though I seem tame. Winter Soldier: Thank you, comrade— for coming here in person to tell me of your forthcoming marriage. We were sweethearts. Now we are not. It’s a great honor to marry a test pilot hero of the Soviet Union. Natasha: Yes, comrade Winter Soldier. Some follow up to this question and this scene. Winter Soldier’s attitude towards Natasha’s impending marriage is completely different here than in the Captain America scene, but I don’t think either is necessarily wrong. The man in this scene is very dutiful Soviet automaton (everyone is named comrade!! 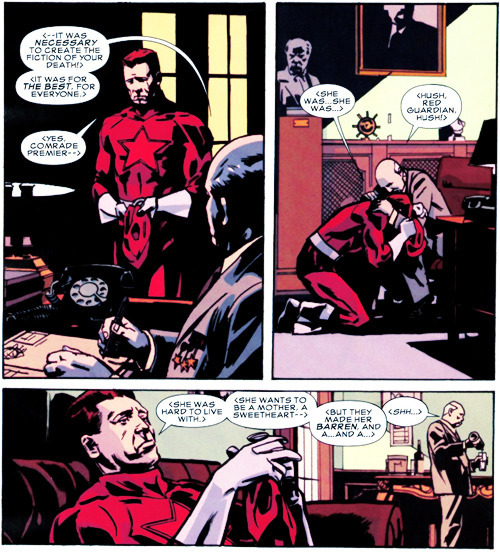 ), the man in the other flashback is reminiscent of the real Bucky Barnes. It’s not hard to imagine that his personality’d change depending on how well he was overcoming his programming. But we’ll probably learn more in the upcoming Captain America & Bucky #624. From Black Widow: Deadly Origin #2, by Paul Cornell and John Paul Leon. Natasha: Hah! Don’t you think Khrushchev would have laughed to see us now? Bucky: You could be… if you weren’t so tough. Natasha: Thank goodness you’re immune. The most interesting thing in Deadly Origin, besides Leon’s artwork (not pictured), was the specific historical grounding Cornell gave to her backstory. Khruschev wasn’t just a ghost mentioned in passing, he was actually a player in the narrative. I know and understand, to some degree, why people dislike the idea of Natasha’s infinity-formula expanded backstory. It complicates things, and god forbid comic book characters be complicated. But the truth is Natasha’s character concept is as historically rooted as Steve Rogers’. And it’s much easier to explore in this kind of grand retrospective than within the constraints of the sliding timeline. Khruschev made an appearance in her 1964 debut, too. Natasha: Ivan, I got some water… the gangs left nobody alive. I can’t find a medic. Take this, I’ll try again. Winter Soldier: The comrade needs medical treatment. My superiors offer you both this chemical in exchange for your renewed loyalty. It will heal him— and increase both your life spans. But there is an extremely limited supply, comrades. This aspect of Cornell’s Black Widow origin was something I really appreciated. It’s a good retcon because it touches on the same themes of the previous story— it’s still about how Natasha’s loyalty to those she loves allows the KGB to manipulate her into becoming a spy. But repositioning the story so that it’s Ivan, and not Alexi, escapes a big my love interest is dead!! cliché. And I think this version highlights the determination in Natasha’s character. We understand that it’s a poor choice, that she really has no choice at all, but it still feels like Natasha is making a choice. (Instead of just being brainwashed or tossed into a killing school at the age of five.) She still didn’t want to be a spy— it was something she was strung into. But better that then dead. Could’ve done without the Communist Cyborg Formerly Known as James Barnes here, though. Almost worth it just for the totally gnarly (and not super continuity friendly) take on his arm. Almost. From Black Widow: Deadly Origin #1, by Paul Cornell and John Paul Leon.